Since their first arrival in Burma in the early 1800’s Christian missionaries have continued to play a significant role in defining Karen identity; whether it be the likes of Reverend George Boardman converting the first Karen Christian, the battle cries of Reverend Vinton calling the Karens to arms to fight Buddhist pongyees, or the aid work of the Free Burma Rangers who frequently make cross-border trips into Karen and Shan states bringing with them much needed aid and medical supplies and also distributing bibles and dispensing prayers. Christianity has largely been responsible for what many perceive as what being ‘Karen’ is today – it has been portrayed as lifting the Karens from a backwards heathen hill people to a literate society fighting against the evils of successive Burmese, usually read Buddhist, governments. While the importance of the role Christian education and support has played in the continuing struggle of the Karen people has been immense it also can not be denied that Christianity has been an extremely divisive force among the ethnic peoples. It has been responsible for creating class systems and elites within Karen society and has created great animosity between the Pwo, who are predominantly Buddhist-animists and are the majority, and the Sgaw, large numbers of which have been converted. While a great number of Karens, especially those who are Baptists, will go to great lengths to deny this, the split, in late 1994, between a number of Buddhists, pre-empted by societal prejudices and exacerbated by religious indifference, proves that despite it bringing together the ‘Christian and Heathen Karen’ as was claimed by Vinton the religion has in fact failed in uniting a Karen Nation. 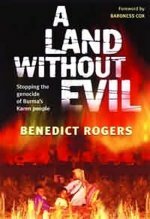 Benedict Rogers acknowledges the fact that his book has been written from a Christian perspective stating in his introduction that: ‘…this book is unashamedly Christian in tone.’ And stresses that it is not anti-Buddhist especially in its coverage of the subsequent Karen split noting: ‘…while I describe incidents where Christians have been attacked by ‘Buddhist’ soldiers, it is the crimes themselves which I and the Karen people hate, not the Buddhist people.’ It is unclear however if Mr Rogers has attempted to understand the Karen people as a whole – or just those that he has met. People who would appear to be predominantly, if not totally, Christian, a group which he admits is only estimated to be about 40% (although he does not say how he came to this figure which is probably an exaggeration if one also considers the fact there are no accurate figures for the Karen population). It is perhaps the author’s inability to recognise the fact that there is another side to the Karen people that is allowed to taint what could have been an extremely important book. The plight of the Karens, all of them, tells a story of oppression and attempted genocide and it is these crimes, perpetrated by a military regime seeking to ensure its continued existence, that deserve to be brought to the attention of the world and a suitable response by the international community furnished. While the book professes to be ‘stopping the genocide of the Karen people’ it sadly fails in not knowing exactly who the Karen people are a situation that was also prevalent among the early missionaries in the 1800s. Rogers has sadly been unable, or unwilling, to delve deeper into the problems affecting the Karen people and sees it, in a somewhat blinkered manner, as a simple good against evil battle. There is no doubt whatsoever that religion has been used by all sides to create division. The SPDC and previous Burmese governments have frequently referred to the Karen struggle as an imperialist, Christian plot. While even as far back as 1887 a number of British officials were decrying the arming of Karens as an attempt by missionaries to cause conflict between the Karens and the Burmans. However such facts have been totally ignored as the author attempts, as one would expect, to paint a picture of Christians coming to Burma and saving the Karens from themselves – a belief, unfortunately many Karens still maintain and continue to be taught. Perhaps the naïveté of the author’s viewpoint is best expressed in an article that was published in the Irrawaddy’s April 2004 issue in which he condemns, in reference to religious persecution in Chin state, that: ‘In one of the most insidious examples of persecution, the junta has sent hundreds of Buddhist missionaries to Chin state in an effort to convert Christian Chins.’ It is true such actions are insidious as most Christian missionaries were aware when they were doing the same thing in Karenni and Karen states in the 1800’s. The fact that the author fails to see the parallels is somewhat concerning considering the large amount of influence Christian groups have in Karen society. The book’s main focus seems to be in praising those Christian Karens and their ‘Young White Brothers’ who continue to help the Karens: the important work performed by the Free Burma Rangers who have tirelessly helped Karens, regardless of denomination, takes up one chapter. While others like Baroness Cox (CSW), Dr Martin Panter (CSW), Joseph Pitts, Saw Sarkey, the only non-Karen member in the KNU Central Committee, and also unexplainably James Mawdsley (Rogers is a trustee for Mawdsley’s Metta trust) are all mentioned. While the support and assistance these people have given is without doubt and deserves to be praised, such platitudes are lost in a book that seems so helplessly one-sided and devoid of any real non-partisan research (the DKBA split is mainly based on an inaccurate account given in Christian Goodens’ Three Pagoda’s book and more precise information could have been obtained during his trips to Mae Sot if he had so desired). Sadly, the Karen struggle has so often been ignored by the outside world and any attempt to bring it to the attention of others is exemplary. It is a shame that what could have been an important conduit for informing the public is lost in what amounts to a publicity exercise for Christianity.